CONTACT US FOR A COMPETITIVE BAND QUOTE! 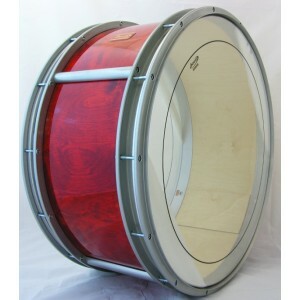 The Original Series Bass Drum is built to deliver world class results for pipe band players of all levels. The drum provides a rich and clear tone which works perfectly to accompany and compliment a vast array of drums within a modern pipe band. The Original Series Bass Drum is built to the highest industry standards, thus ensuring quality and longevity. 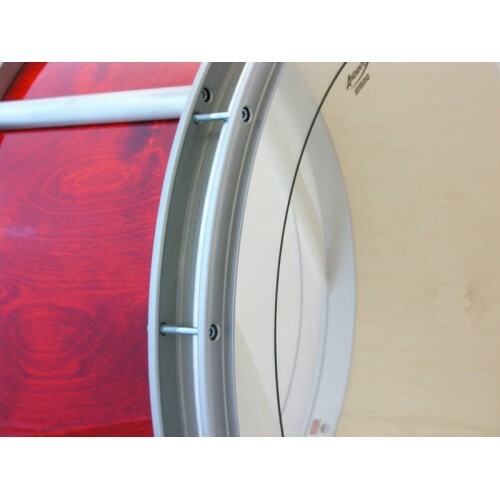 Lightweight - The Andante Bass Drums are constructed with four lightweight alloy extrusions retaining a non-porous acrylic or wooden shell which makes the drum extremely light and easy to carry. Temperature Pitch Control - Top and Bottom Assemblies are made from a high grade aluminum, as the temperature of the atmosphere changes, the metal will expand or contract. The expansion rate on both heads will be approximately the same this ensures that your top and bottom assemblies stay in tune with each other. Tuning - There are 14 tension screws on each head. This makes it easier to achieve even tension throughout the entire surface of the head. Damping fitted and tuned by a meter. Sound - Andante Bass Drums are designed to produce a sound that is in harmony with the drone section of the bagpipe, balancing the overall sound of the band thus enhancing the ensemble. Carrying Hook - The carrying hook is firmly fixed to the two alloy retaining rings and gives a choice of single or double carrying points. Adjustments - All dismantling, reassembling and adjustments require a 5mm T-key.